Quote: "As long as one innocent being is threatened, none are truly free." Views humans as if they were his own children -- will expend his last drop of fuel to protect them. Seeks human friendship, but humans fear his hulking, mechanical form. Can lift 300,000 pounds with one hand. Impervious to most artillery, can surround himself with force field for brief periods. Carries fireball cannon... shoots 2000 degree bursts of blue fire 1.5 miles. First, we'll start with their leader, Hot Spot. 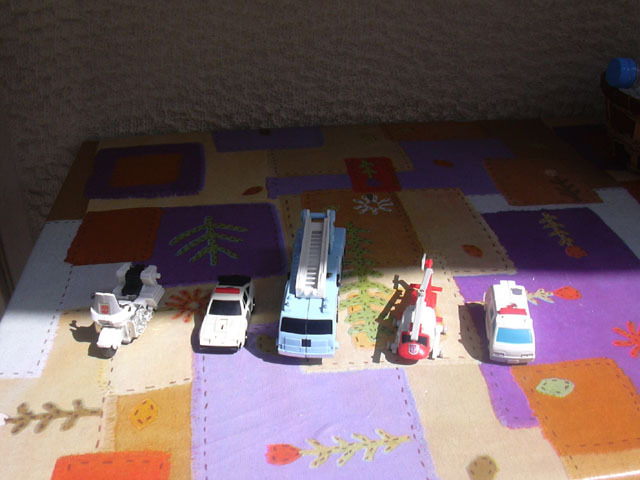 Alternate Mode: Hot Spot is a blue fire engine with various black details. He's not as nice as Inferno, but nevertheless decent for a G1 bot. Two sculpted hoses embrace his side, as well as mechanical touches behind them. The cab part has black plastic windows, a chrome fender and sculpted sirens (moulded in blue, no transparent plastic here as with Inferno). The ladder on his rear can extend quite a bit, and the base can turn a full 360 degrees. On his back, Hot Spot's plastic is moulded with a lot of trim, perfectly evoking a 'metallic' look on his surface (even though it's made out of plastic). Finally, it's worth pointing out that Hot Spot is the only gestalt part out of them all that features rubber tires. And six of them! Robot Mode: Hot Spot's transformation is a bit reminiscent of that of Onslaught [they are supposed to be rivals, right? ], and he is about the same height as Jazz in this form. A new colour added to this mode is a dark red in the chestplate [which comes in a die-cast metal or plastic variant]. Sadly, Hot Spot has little to no detail sculpted in this form. You have to apply the stickers if you want to see some variety in this robot. Next up, a name that has been recently used, First Aid! Alternate Mode: Just like Hot Spot, First Aid imitates the vehicle mode of a previous Transformer. In this case, he is an ambulance, just like Ratchet was. If you choose not to apply the decals, he ends up looking really plain. That's right, he has almost no sculpted details, save for a front fender and lights. His windshields are blue stickers, so there's not much to talk about here. After applying the decals, he ends up looking like a real ambulance for once. Unfortunately, First Aid has no rubber tires. I fail to see how they could come up with such small tires, so it's not really their fault. Were he to have rubber tires, they'd be split within seconds. Robot Mode: Extend the legs and flip them around, pull the arms out and turn the front part over...that's how difficult his transformation is. A bit laughable, but he also has to double as a gestalt limb. First Aid reveals a lot of red in this mode; his chest plate, thighs and head are all red. He has quite a few sculpted details on the head, but they are hard to see due to its size. For a gestalt limb, First Aid has the typical articulation. His arms can go up or down and he can bend at the knees [please note that he has no legs below his knees, just a concrete piece of white]. And to make him more dangerous, they've given him a puny handgun! It should be noted that he also came with a dual barreled cannon that could be attached on his back while in vehicle mode, but there's no place for it here. One last note: Some versions of First Aid came with a metal chest, while others had a plastic one. Both of my First Aids are the plastic versions. Alternate Mode: Streetwise is a police car, but not a Datsun like Prowl. I have no idea what model he is supposed to be, but he's not bad. Like Prowl, he is all white with some black on his front fender and spoiler, and a black windshield [the windshield being pre-applied decals]. There's not much you can do with him aside from opening the hood and finding a red piece sticking out. You can also apply a dual barreled cannon on his back, just like with First Aid. The cannon can turn around [Or was that First Aid's? Oh well] but also slide to the sides, as if it's protecting the doors. The underside of the car is made of die-cast metal, and that is true for both Streetwise toys I own. Maybe the plastic version of this one was rarer? Robot Mode: His transformation scheme is almost identical to First Aid's, but there's no front piece swinging back. Streetwise is more special than all other getalts limbs, because his head isn't meant to serve as a connection point to any gestalt leader. This grants his head some long-desired symmetry, with horns on the sides, a decent face and painted blue eyes! There aren't any new things to take notice of in this mode except of the robot head...everything is as it was before. The car hood doubles as his chest here, making him look a bit goofy if you don't raise it a bit. He can bend at the knees, just like First Aid, and he can hold his handgun much, much better than any of his other three teammates [Hot Spot is excluded] because the peg is facing upwards on his arm, and not on the side. That's all there is for Streetwise, sadly...move on, people! Nothing to see here! On to the black sheep of the group, Blades! Alternate Mode: Blades is one of the first autobot helicopters to debut in G1. He uses a red and white colour scheme [plain colours, nothing to speak of], along with some black for his windows. His rotors are coloured in a dull grey paint. Detail wise, there are some sculpted lines on the back of the vehicle [Damn it there's so few things to talk about G1 gestalt limbs that it's impossible to keep writing interesing stuff]. Blades has grey plastic wheels so he can roll on any surface, his rotor blades can swivel around a ratchet joint, and there are two white blasters that can be attached on his tail, giving him some firepower. Last of the group, Groove! Alternate Mode: Groove was released the same year as Wreck-Gar, but was featured in the cartoon much earlier. That makes him the first transformer to be a motorcycle in his alternate mode! Many would go on to copy him afterwards [Wreck-Gar, a couple of Gen. 2 moulds, Sideways, Gasket] but he'll always be the first. And the only one so far to be a police motorbike! As an individual, Groove is the most interesting out of the group. For an autobot on two wheels, he is extremely well balanced. White is the dominant colour used, but there is some black [the seat] and a lot of chrome [on the sides]. The engine is sculpted really well, and these details are set off by the chrome on them. The seat has ridges and lines, but it's hard to see it due to the black colour. The dashboard is nice to look at and the handles are pretty neat. The 'windshield' [don't have any better word for it] isn't made out of see-through plastic, but rather a dull grey. Doesn't hurt the look at all. Like Blades, Groove can equip two [black] blasters on the sides. Robot Mode: It should be noted that Groove is perhaps the biggest BRICK of a transformer I've ever seen. He is shorter than all his comrades, and just so...square! His engine parts become his hands [that don't slide to the sides at all] and can only move up and down. His feet are essentialy the seat, turned around and separated. The front part of the bike is whirled around and...that's it. There aren't any details to speak off besides the die-cast chest. His head is black and has a bronze face [interesting]. And finally, the meat of this review! Make way for...Defensor!!! Robot mode: Let's face it. With the exception of maybe Hot Spot, these figures wouldn't sell well if they hadn't had this gimmick. 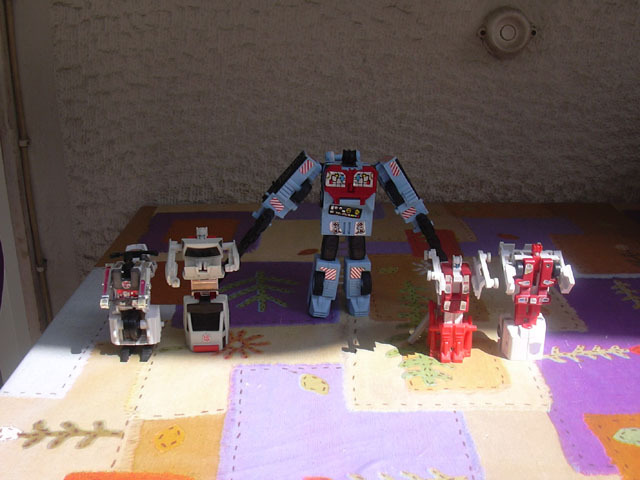 These five autobots merge together to form Defensor, a figure that has to be a bit taller than G1 Prime. Defensor was one of the three Autobot gestalts that were released in America or Europe [the other two are Superion and Computron] and he is, in my opinion, the most well-proportioned one. Utilising Groove (the Brick) and Streetwise as legs, and Blades with First Aid as arms, you just have to attach some parts to Hot Spot and Defensor is ready. Transforming Hot Spot to gestalt mode requires a few more steps than it would to get him to robot mode. Namely, the legs have to be all spread out and then bent [like sumo wrestlers], the arms have to click on the sides and the head has to slide in. After that, it's just attaching the limbs and lifting the head up. As a robot, Defensor has 4-6 points of articulation. His arms can move up and down and to the sides, his head can move to the sides and look up, and the legs can bend at the knee [requires some effort, probably re-attaching the limbs]. That's a lot for a G1 gestalt, considering that Superion had only 2. In the colour department, Defensor fares adequately. There's blue on the main body, white on three limbs, black on his chest and waist...and then there's red on Blades. Sure, some white is seen on that arm but not enough. I shouldn't complain though [look at Menasor, for example]. 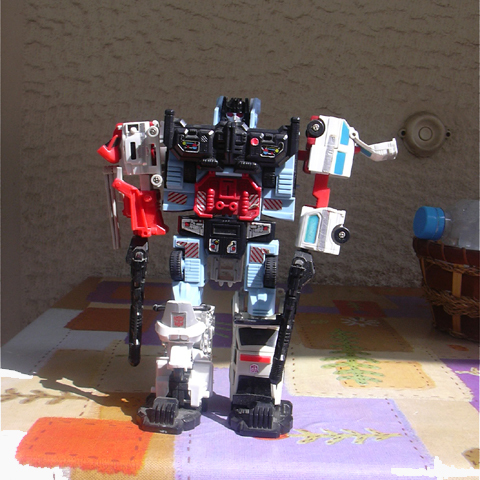 Out of all gestalts, I think Defensor comes fourth in the colour uniformity. You'd expect a big, bad bot like this one to be armed to the teeth, right? Well...he isn't. Neither of his fists can be substituted for a missile launcher [ala Devastator] and he carries no big bad sword [like Predaking, Piranaking and Menasor]. Instead, he uses the same two black blasters that Hot Spot has. At least they have nice details sculpted on them. Speaking of mecha details, Defensor has a few. His sides are full of them [being the arms of Hot Spot] and his chest panels are nice to look at. His head is very human-like and reflects a defender/protector personality. His abs have a few lines and tubes embedded in them. So, how does Defensor fare after all? Is he worth spending the money he goes for on e-bay? Personally, I'd say no. With the exception of Hot Spot, the team isn't that well-designed or even interesting. 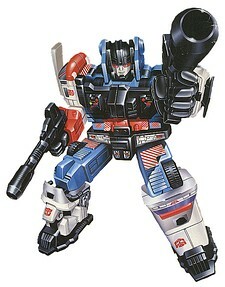 As a gestalt, Defensor is ok but not on par with today's gestalts [Magnaboss, Rail Racer, the recent Energon combiners]. There are far more interesting gestalts in G1 than this one, sadly. Transformation: 3. Nothing too complex, nothing too easy. Assembling the gestalt is fun. Durability: 8 as a gestalt, varies with the limbs. There isn't much that you can break on Defensor, perhaps the waist piece will fly off. However, as stated, you have to be really careful with Groove. The white is prone to yellowing. And let's not forget that if a head snaps into a connecting piece on Hot Spot, you are royally screwed. Fun: 4. Yeah, Hot Spot is cool. The rest can be used for demolition derbies. Price: 4-5. He can go for anything between 70 dollars and 200. For me, he was free.